Online Counseling Degrees can be found at universities all over the country. This type of degree may be one of the most popular for upcoming college students, since it can provide students with the skills necessary to help others that may be going through periods of difficulty in their lives. Online programs in counseling may consist of courses that require online log-in, virtual discussions, student chats, and testing tools via the online system. Students at the masters in counseling (most common online degree in counseling) level may also have the option to upload research assignments via the online classroom, which is a change that has even been implemented in traditional learning environments. If you are considering a transition into online Masters in Counseling degree programs, you should locate a degree program that specifically fits your scheduling needs, contains CACREP accreditation, and can lead to licensure in your state after completion. Check out our comprehensive review of schools with online Master of Counseling programs. Our team of educational experts has review these online programs in an attempt to provide you with more information about what they contain and what they can do for you after completing them. Read more in our guide below to learn some more facts about them. In the new age of technology and ease of communication, students may be seeking out convenient options for their education. The cost of living throughout the United States may be constantly rising, making it necessary for college students to maintain full-time employment while pursuing their dream degree. With these factors in mind, many new counseling prospects may be searching for degree programs that can fit their diverse scheduling needs. The introduction of 100% Online Counseling Programs may be a game-changer for upcoming students that require extensive flexibility within their program. Your 100% online program may only be as good as the university that provides it. Students that are interested in online degree programs may often be concerned with the quality of online degree programs, since this method of education is different from the standard college norm. 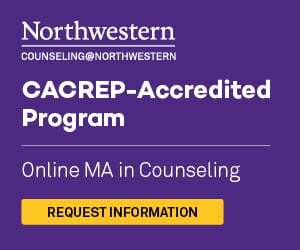 When considering a Master of Counseling degree, you should consider a CACREP accredited program. CACREP is considered the "gold standard" of counseling accreditation for any university - online or campus based. There are multiple reliable and reputable universities that can offer you the option of pursuing your counseling degree online. Each of these universities contains reviewed and accredited programs that could be a great addition to your current resume. Read more about these specific programs below. Northwestern University: When it comes to quality and quantity, Northwestern University may have everything you need to meet your goals. The online Masters in Counseling at this university can be a great resource for students interested in pursuing a general field of study or even those that may be interested in choosing a specialization. This program can be competely entirely online and can provide students with the option of adding the Child and Adolescent Counseling specialization to their degree program. These programs are currently CACREP-accredited. George Washington University: Found in Washington D.C., George Washington University may be a great option for students that are seeking reliable and flexible online Master's in Counseling degree programs. The most prominent online counseling program at this university is the online Master's in Rehabilitation Counseling - a potentially great option for students that may be interested in working with vulnerable populations. This degree program can take anywhere from 2-3 years to complete, depending on the time you can commit to your learning. New York University: NYU may be one of the largest providers of online counseling programs in the country. This university can help students achieve their online Masters in School Counseling or their online Masters in Mental Health Counseling. Each of these programs can help students learn more about providing assessments and treatment planning for clients in the field, a thorough review of the ethical requirements of counselors, and education into the communication methods relevant to client/provider success. Each program may consist of a 60 credit hour curriculum that can be completed in around 3 years. In online degree programs, students may be expected to participate in the same courses found in the traditional environment. Online courses may have varying layouts depending on where you are enrolled, but they all may contain similar elements. One university providing a completely online program allows students to review all expectations of the course on the first day. Students can log in to their online course room and view a layout of assignments, assigned readings, and course projects, which can allow for transparency and pre-planning for busy students. If you would like to see a few examples of courses that can be required in online Masters in Counseling programs, read through the course list below. Counseling Approaches and Intervention: Students enrolled in online courses pertaining to approaches and interventions may begin with a look at the fundamental properties of the field of counseling, theories that have driven growth in the field, and approaches that have shaped counseling techniques as they stand today. This course may include a look into developments in assessment, treatment planning, and psychotherapy interventions designed to assist people with finding solutions to their most difficult life circumstances. Crisis Assessment and Intervention: Regardless of which specialty field you may choose for your degree program, there may be instances in which you are faced with crises of varying proportions. This course can help you prepare for assessing the level of crisis, implementing strategies for de-escalation, and treatment planning that may include crises prevention for the future. Students within this course can also learn more about methods that can be used to protect oneself and others against violence during a crisis, as well as acknowledging behaviors that can be indicative of distress. Counseling for Families and Groups: Counselors may often be tasked with working for groups of families that share a common goal. While counseling techniques for individuals can be unique and person-centered, the dynamic slightly changes when more people are involved in the treatment process. Counselors taking this course can learn more about communication tactics for working with groups, mediation skills that can be helpful to keep a peaceful and therapeutic environment, and ways that group therapy can be a useful tool for both individuals and families alike. 100% online counseling programs can be helpful in providing students with flexible course work that can be completed while still employed full-time or while managing everyday responsibilities as an adult. Within these programs, students can use their own scheduling methods to complete course work and engage with other learners in their course rooms. At the end of these degree programs, students may be expected to locate a placement for their independent practice requirement that may be required for licensure. In order to give you more information about this process, our team of educational experts has reviewed the supervised experience policies for different states throughout the country. Some colleges may offer assistance to students that are seeking internships or positions in counseling after they have graduated from their program. Some online counseling programs can assist students with securing a placement for their supervised experience, while others may leave it up to the students to find an organization to work with after graduation. It may be an important step to review what type of support your program can provide throughout this process, so that you are not left without an experience option towards the end of your program. Students that choose to pursue their degree through online universities can take advantage of the same opportunities as traditional learners. CACREP accreditation can allow for universities to have their programs reviewed for reliability, which can lead to licensure opportunities for students that complete accredited degree programs online and take part in 2-3 years of supervised work experience. High-ranking universities may also offer online options for students that are geared towards counseling careers in their future. Our team of educational experts has pulled some of the most common counseling careers below for you to read through. The goal of the counseling student may be to acquire skills that can assist them with guiding others to happy and satisfying solutions. If you have shown an interest in this field, you may be the type of person that works hard to help others meet their goals, have empathy for those that are going through difficult life circumstances, and contain the drive necessary to work through difficult situations on a regular basis. Some of the best methods for achieving your goal of helping others is to gain licensure within the field of counseling. Currently, online degree programs in counseling may be a convenient route for meeting the minimum degree standard. Is this the right option for you? Online degree programs can provide students with a flexible alternative to traditional degree programs. Online Masters in Counseling programs can be completed entirely through online course work that may include the need for internet access, a reliable computer, and extreme self-control. People that are determined to complete their program and have the structure it takes to stay on track may find that this is the best option for a higher level degree. Online programs can also be excellent options for currently employed professionals seeking career advancement without forfeiting their employment. The traditional learning environment is one that may be well-known and familiar to current degree holders. While this option may be the best choice for newly graduated bachelors earners, it can also be a great way for returning college students to become re-familiarized with the learning environment. Some students choose this method in order to connect on a more personal level with their instructors – which can be beneficial to students that are struggling with maintaining focused on completing their course work and assignments. View Online Master’s in Counseling Programs. View our list of 40 different online Master’s in Counseling degrees. Your needs can help you decide whether online or traditional programs could be the best option for you. In terms of flexibility, online degree programs may definitely be the better option due to personal scheduling preferences and the ability to complete course work at your own pace. Online degree programs can also allow students to communicate with other students and instructors through the online course room, which is a convenient option for students that need assistance or support throughout their experience. However, some students are drawn more to the traditional degree programs in counseling in order to engage in the traditional experience of group learning in an educational environment. The choice is ultimately yours and should be based upon your needs and preferences.